The wounds of war are not only physical and mental, but also spiritual. As such, soul repair is core to the healing process and all of our Veterans must be provided a spiritual haven. Through its restoration, the Wadsworth Chapel can provide this resource and once again act as a beacon of hope for the generations of Veterans to come regardless of their beliefs or traditions. Of note, it is stated that the Pacific Branch of the National Home is required to have a spiritual center in 5 separate paragraphs of the original deed. Healing the wounds of war has always been a timeless, sacred and spiritual work. The renovation of the Wadsworth Chapel can be the shining light for the soul of this work- ensuring the West LA VA campus to be the healing place our veterans deserve. The chapel is the soul of military bases all over the world. The renovation of the Wadsworth Chapel brings the soul back to a West LA VA campus in dire need of reform. You can not underestimate the power of bringing the soul back to the work of healing. Following an 1887 Act of Congress, making possible the donation of land to support a home for Veterans in the western region of the country, the “Pacific Branch” of the National Home for Disabled Volunteer Soldiers (NHDVS) was established on what is now referred to as the West Los Angeles VA Campus. The NHDVS, envisioned by our legendary 16th President Abraham Lincoln who mandated its development just one year after the end of the Civil War in 1866, was created to provide a home–flush with quality living quarters, a family of fellow Veterans, various healthcare and support services, opportunities for purpose, amenities for comfort and environments to heal–to Veterans struggling with life following their service to country. Shortly after the land was deeded, and before the first barracks were opened in the late 1800’s, 800 Veterans had already set up camp and started living on the property. In fact, it was such an attractive resource at the time that, per report, one Veteran, struggling in life and determined to live in the national home, walked to the site all the way from Yountville to hunker down. The Wadsworth Chapel, built in 1900 in the heart of the original home as its spiritual core, remains one of the region’s most important and iconic landmarks to this day. Named after the home’s first Chief Medical Officer, Major James Wadsworth, this classic example of Victorian architecture is the second oldest building on the property (the Trolley Depot being the oldest), and is the oldest building on Wilshire Blvd. Despite its current state of extreme and shameful disrepair that has resulted from neglect over decades, it still stands tall as the crown jewel of this VA, and perhaps all VA nationally. Openly visible to the thousands of Angelenos who drive past it daily, we must make absolutely sure that it not only continues to stand tall for all generations of Veterans to come, but also that it beams bright as a beacon of hope and a bold symbol national pride. The turnaround starts with you, here and now. With your help, we can turn the Wadsworth Chapel back into a majestic place of reflection and spiritual healing. It can and must once again be a foundation for the home going forward, bringing our Veterans together for themselves, for each other, for the community, for the country and for the future. Thank you for being a part of this mission and helping fuel this effort to reboot Lincoln’s vision again by reestablishing a national home for Veterans. Please click below to request for more information. Copyright © 2019 1887 Fund. All Rights Reserved. Land use is proposed as existing, preferred, and alternate, allowing for flexibility in future development decision-making, but establishing the tone and character of each of the areas of the campus. Within this flexible framework, specific ideas for focusing new development as well as re-purposing existing facilities are suggested in the figure to the left. 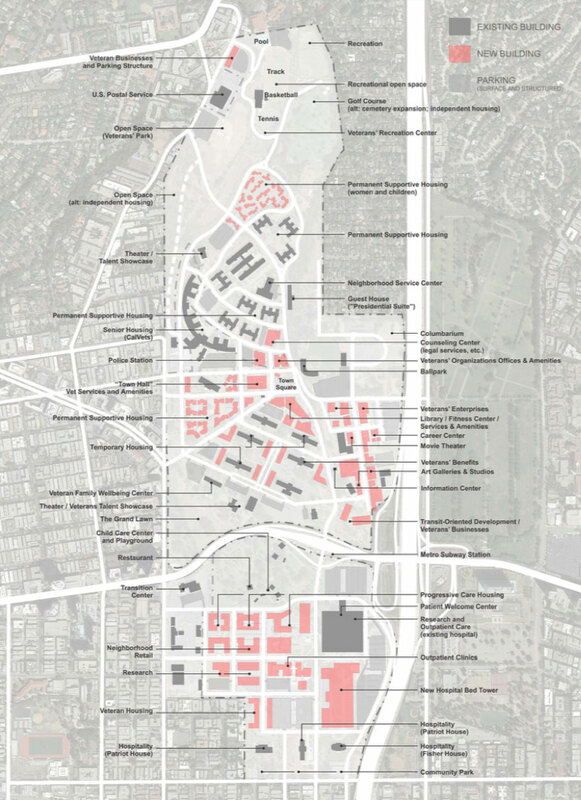 The Master Plan Framework places an initial and immediate focus on permanent supportive housing for homeless or at- risk Veterans within a nurturing, safe, and secure core area of the site. Initial phase permanent supportive housing will be located in the central portion of the north campus, with a projected capacity of 490 housing units. Of these, approximately 150 units are proposed to be new construction in a townhouse- type complex, with the balance located in nearby renovated buildings. Future housing will be located in a combination of renovated buildings throughout the campus, as well as in new infill construction. 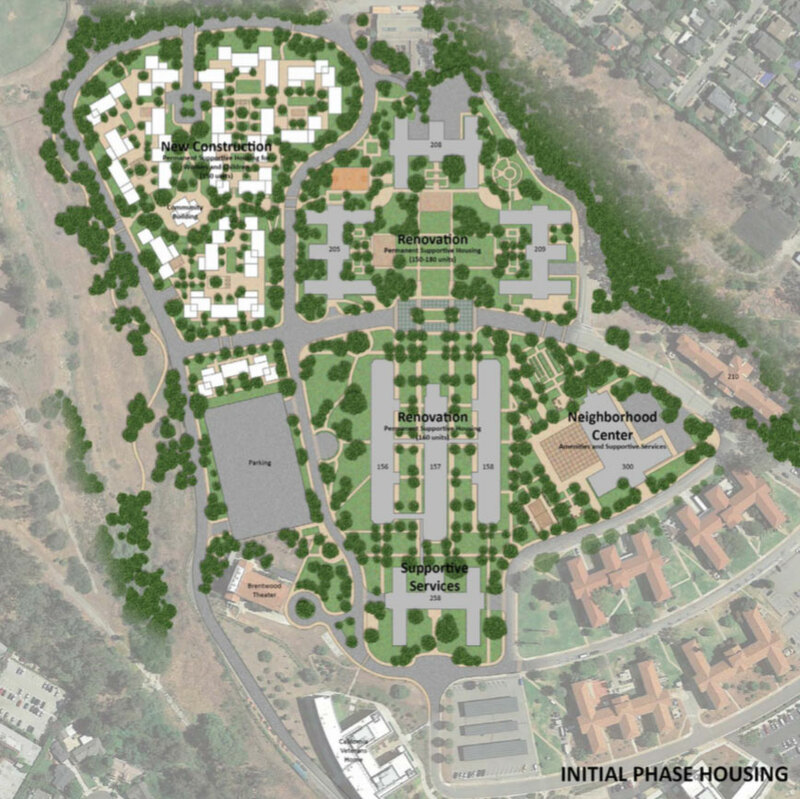 Beyond the currently projected demand for 1,200 units, the Framework Plan indicates an overall capacity on the 388-acre West LA Campus of up to approximately 4,000 units of housing of various types. This capacity can absorb future demand as need dictates based on local and regional demand updated through 3- to 5-year reviews.